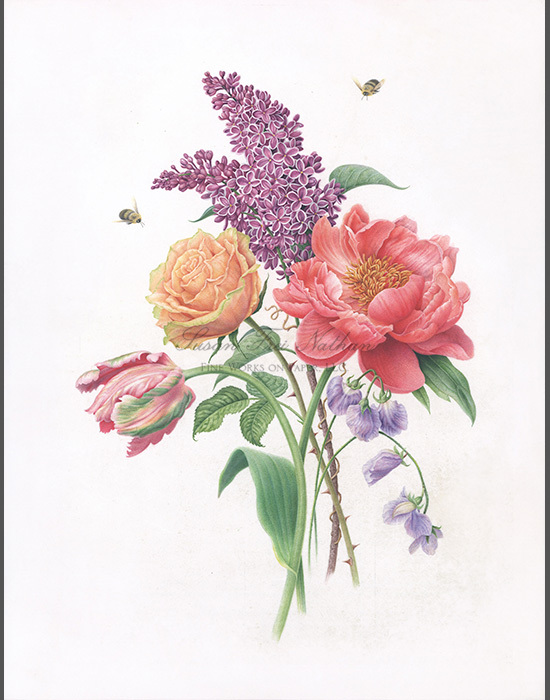 At the perfect moment, our second installment of botanical artworks has arrived, inspired by Spring. Showcased are a wide variety of subjects experienced in nature during this magical, bloom-filled rebirth. Nature’s Voice, Part II: Spring-Summer features master artists who specialize in dry-brush watercolor techniques, hand-colored printmaking, and reconstituted limestone sculptures. 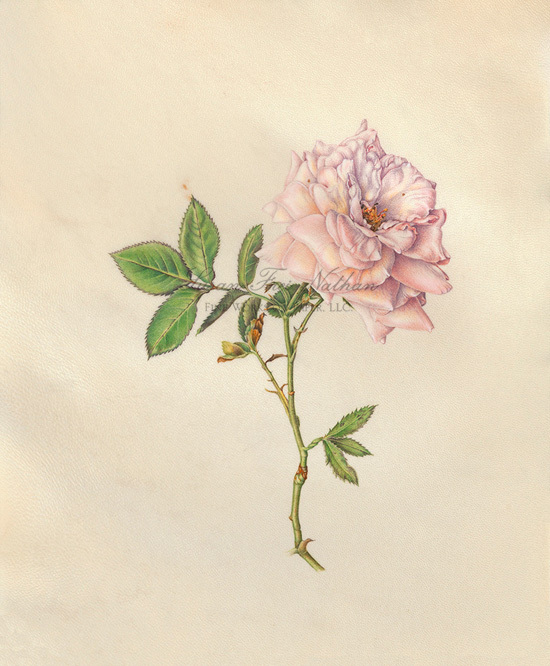 The artists offer a powerful and beautiful view of the plants through their unique stylistic interpretations, differentiated by their individual artistic perspectives. The common ground, however, is a clear and ever-lasting appreciation for nature. They draw knowledge and inspiration from the plants, creating mind-expanding moments for us through their art. All works of art are available for purchase; a price list is located at the end of the gallery tour. Included are: Beverly Duncan, Monika deVries Gohlke, Jean Emmons, Lara Call Gastinger, Elizabeth Enders, Charles A. Johnson, Esther Klahne, Karen Kluglein, Denise Walser-Kolar and Carol Woodin. This piece continues the story of Duncan's daily travels through Ashfield, MA. Here she captures in great detail examples of nature in the warmest months in her remote town. Included are: Black Carpenter Ants, Daylily, 'Milkmaid' Nasturtium, immature Morning glory Seed Pods, a Poppy Seed Pod (a purple poppy) and Imported Cabbageworm Moth. 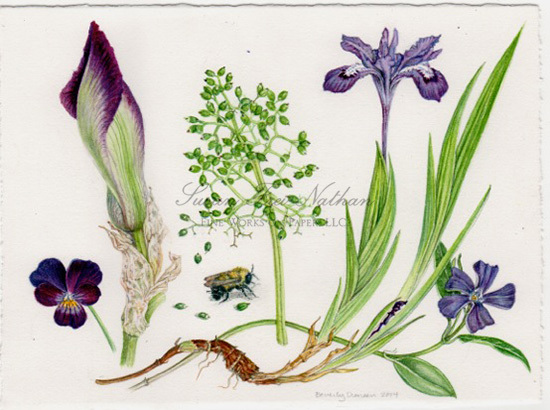 Her compositions are thoughtfully composed to highlight each specimen in its growing season. Duncan's Four Seasons Collection of paintings shares the story of the artist's nature walks in her hometown. 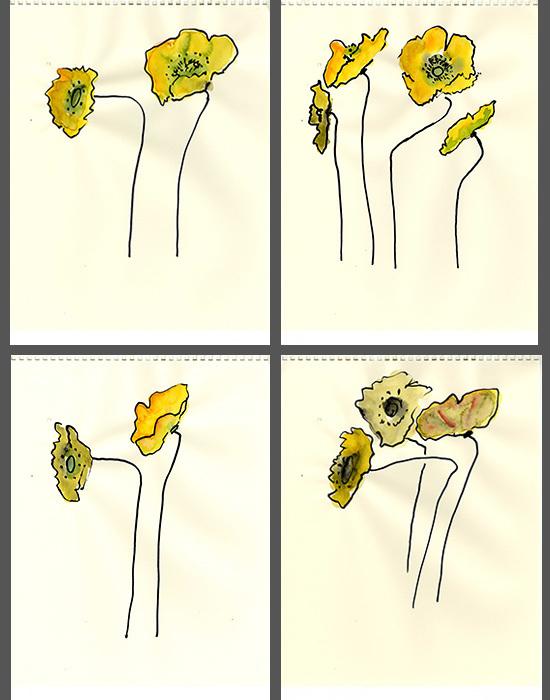 Throughout the seasons she documents the flora as it unveils itself. 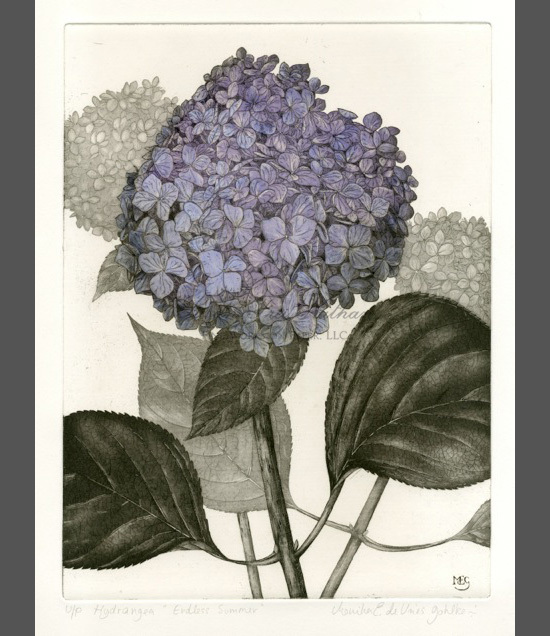 In her watercolor Spring Purples she features Viola or Johnny-Jump-Up, Irises, Periwinkle, Red-berried Elder and Golden Northern Bumble Bee. We experience her part of the world through these luscious specimens, informing us of a specific time and place through her perspective. This is a traditional landscape with the foreground, middle ground and background; the only thing missing is the garden from which it grew. The artist's European roots suggest her historical compositional approach. Captivated by the largess of this Hydrangea's bloom, we admire how proudly it carries its head high during the summer months, providing hours and hours of aesthetic pleasure. 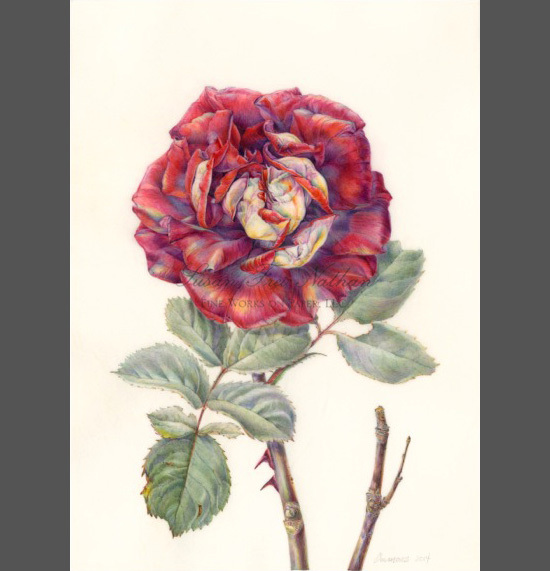 Regarding the actual painting of this Rose, Emmons states, "Observing a plant in different lighting situations and watching it change over time I am inspired to try different approaches, particularly with color. I love to use multiple layers of under painting in unusual colors. The challenge for me is to pull it all back together after I've created chaos. Sometimes forty layers or more of translucent washes and dry brush are needed. Many of these layers end up covered up. Yet, I feel the layers lend richness to my paintings that I hope people can sense, even if they can't always see it." Emmons works often create a prism-like effect with color, illuminated during different aspects of daylight. 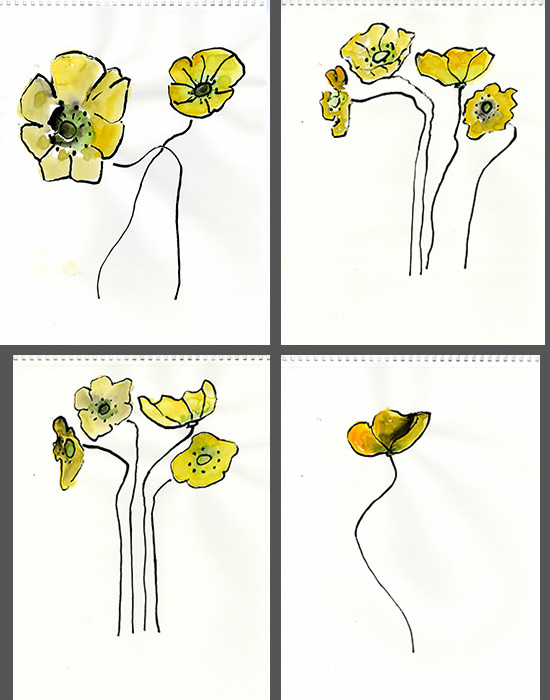 Poppies are part of a growing body of work centering on various botanical subjects explored over decades. Enders seems to captures the natural growth pattern as if it were moving at that moment before our eyes. 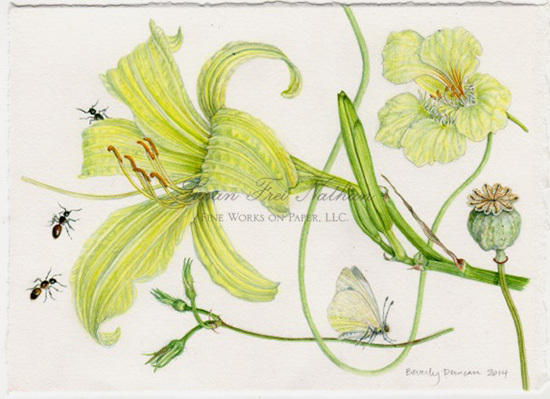 She paints with watercolor at a fast pace, focusing on the plants energy. They embody the influences of abstract painting while celebrating the beauty and history of plant portraiture. 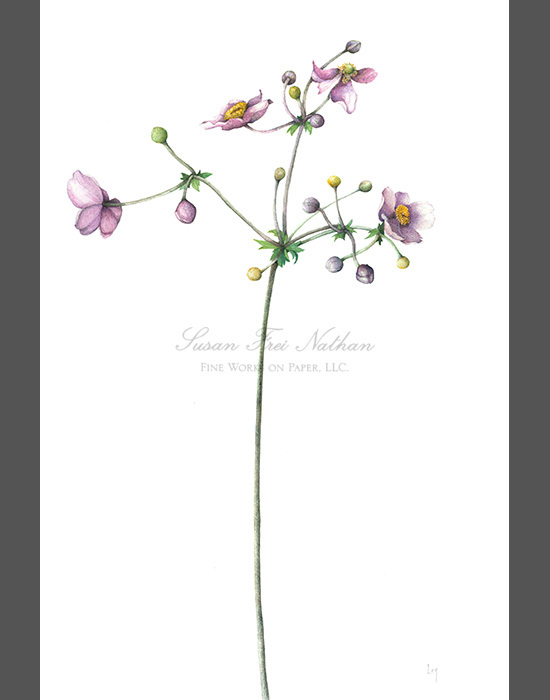 The artist states, "This painting depicts the elegance of the Japanese anemone blooms as they are composed at the top of a long stem. 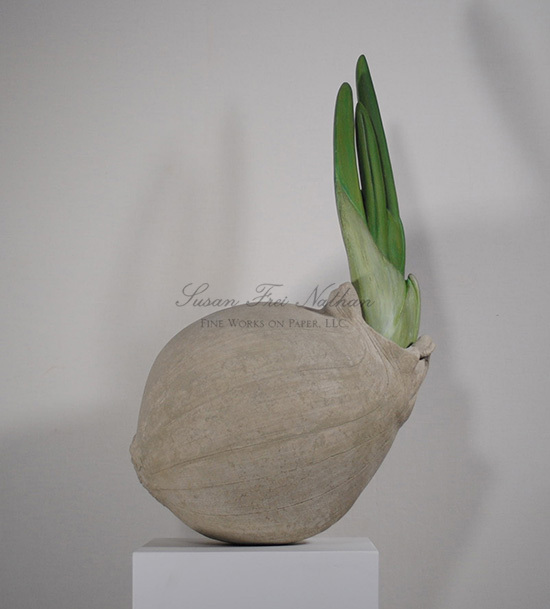 I was very attracted to the softness of the petals and the fuzzy texture of the stem." Here she walks us through the intimate experience of choosing her subject in nature and pointing us to its simplistic beauty. "During all seasons, the character of the unique habitat of Big Meadows in Shenandoah National Park changes constantly. This captures one moment in time at the end of summer with the plants such as fly poison and wild onion blooming," states Gastinger. 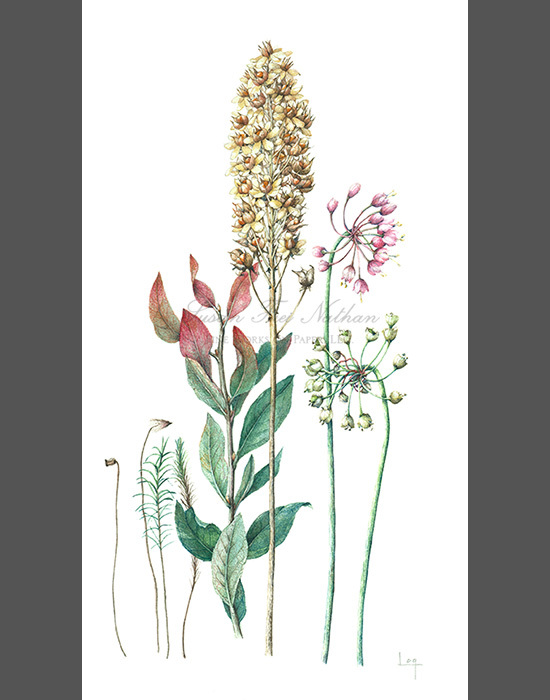 The artist treks through her Virginia landscape, elegantly drawing out the beauty of her surroundings by juxtaposing various botanical subjects within a composition, educating us on its plant diversity. Spring's bounty is evident though the Shallot's girth. Using reconstituted limestone, the sculpture seems heavier than its actual 50 pound weight. This medium allows for the sculpture's maneuverability as it can enhance both indoor and outdoor spaces, welcoming in the season. Plant portraits often times transport one to another time and place. 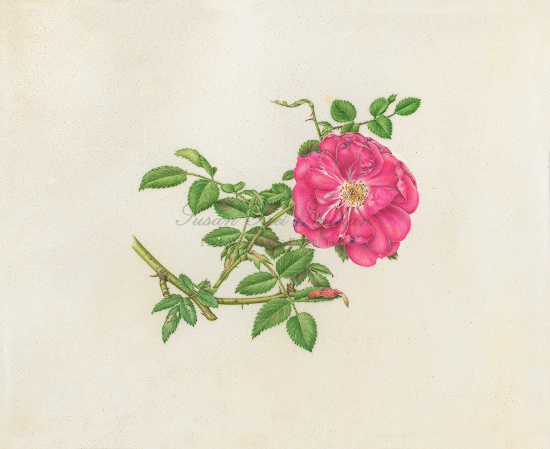 This Tea Rose has an old soul, perhaps due to it being the oldest classified of the modern garden roses. Klahne's use of layered, almost iridescent colors within the petals evoke jewel-like beauty with an historical undertone. This is the flower we patiently wait all season to evolve, that naturally draws us near during a June walk through a magical rose garden. As a classic French rose, Klahne's Apothecary Rose invites us in with the frailty of its minute leaves and stems. These belie the strength possessed within. Reminding us of spring/summer's inherent popularity, here we are enchanted by the thoughtful combination of blooms so artfully arranged in such a celebratory bouquet. The hovering bee validates its sumptuousness. Kluglein's flawless technique affirms her as a master painter within this genre. 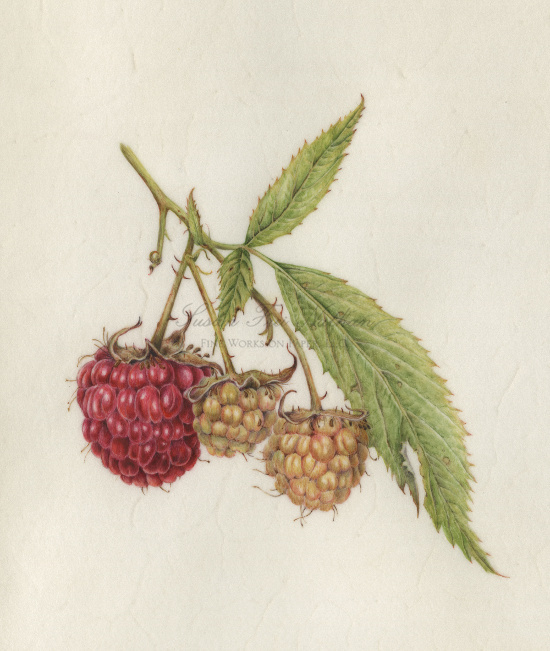 The evolution of the raspberry is explored through this singular branch. 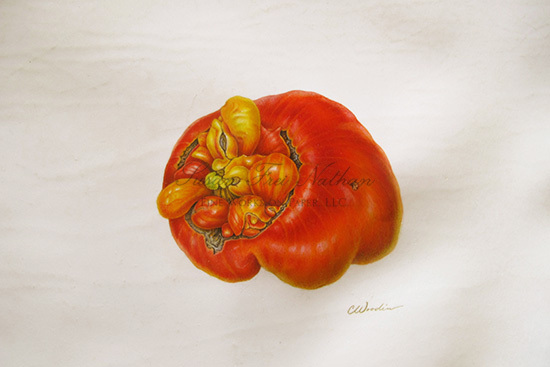 The artist presents this as a magnified experience for the viewer to appreciate the technical stages of the fruit development. Waser-Kolar’s painting style is historically based evoking a romantic sensibility. One falls into the subject as if it caught the eye in nature. 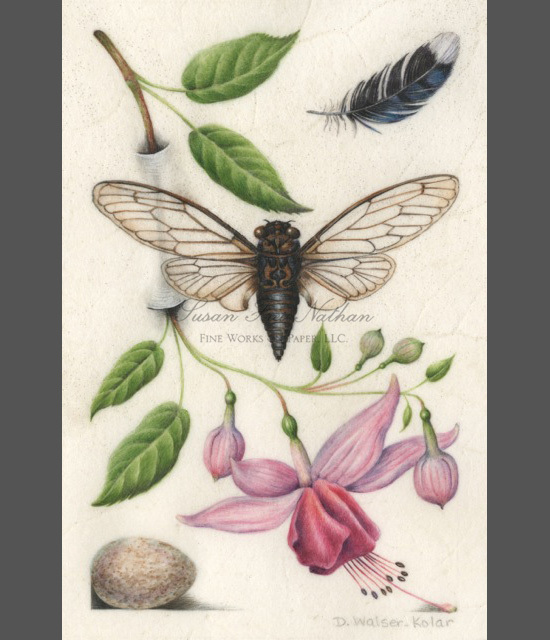 This combination piece includes a Blue jay feather from the artist's backyard, hanging Fuchsia from her front porch, cicada, and Cardinal egg from a nest built in the Fuschia basket. This work is directly influenced by the drawings of Joris Hoefnagel's Mira calligraphie monumenta, or Model Book of Calligraphy, an illuminated manuscript with 17th century studies of flora and fauna. Walser-Kolar's deep fascination with this style of painting informs her personally curated compositions. The choice of subjects and mesmerizing details highlight her attention to accuracy while deeply entrenched in storytelling. This tomato has an abundance of deformities adding to it succulence as a fruit. The off-center composition draws us into its awkwardness and evokes ones curiosity like a circus sideshow act. Woodin's highly stylized technique polishes the subject's features, lending an additional layer of wonder. Interested in commenting? Please visit our Contact page. © Susan Frei Nathan Fine Works on Paper, LLC.